Is it going to rain today? Is it going to stay fine? And how can you tell? One easy way is to measure the air pressure. If it's rising and the pressure is high, chances are it'll be a fine day; if the pressure is falling, it's more likely to be wet, windy, and dull. Instruments that measure air pressure are called barometers and people have been using them for weather forecasting and scientific research for hundreds of years. Let's take a closer look at how they work! Photo: This traditional aneroid barometer dates from the mid-20th century and is calibrated (marked) as a crude weather-forecasting device, but it's simply an instrument that measures the air pressure. The needle turns clockwise when the pressure is rising (indicating fair or dry weather); it turns anticlockwise when the pressure is falling (indicating rain or stormy weather). Photo: Are you feeling under pressure? How much pressure? If you have a smartphone with a built-in barometer, you can nip across to your favorite app store and download a variety of barometer and weather-station apps that will tell you precisely! If you've ever been scuba diving, you'll know just what pressure feels like. Dive down beneath the surface of the sea and you'll soon feel the weight of water pressing in on you. The deeper you go, the more water there is above you, the more it weighs, and the more pressure you feel. But there's pressure pushing in on your body even if you never go in the sea. Look up at the sky and try to imagine the weight of the atmosphere: the huge amount of gas surrounding our planet and pulled to its surface by gravity. All that gas might look like a vast, empty cloud of nothing, but it still has weight. And it still presses down on your body. That's air pressure. When you're under the sea, the weight of water pressing in on your body makes it hard to breathe from your oxygen tank. Air pressure never has this effect because our bodies are hollow and our lungs are full of air, so the air presses equally on the inside and outside of our body at the same time. That's why we don't feel air pressure in the same way we feel water pressure. Air pressure varies all across our planet. It's highest at sea level (where there's the most amount of air pushing down) and gets lower the higher up you go. Way up in the atmosphere, there's much less air—so there's less oxygen to breathe. That's why mountain climbers often have to use oxygen cylinders. It's also why airplanes have to have pressurized cabins (internal passenger compartments, where the air is kept at higher pressure than it would normally be at that altitude) so people can breathe comfortably. Even in one place, the air pressure is constantly changing. That's because Earth is constantly spinning and moving round the Sun, so different parts are being warmed up by different amounts. When the air cools and falls, it increases the pressure nearer to the ground. Regions of high pressure like this are linked with fine weather. The opposite happens when the air warms and rises to create regions of low pressure and wet weather. How can we measure air pressure? 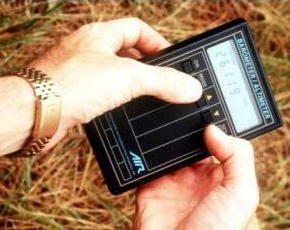 Photo: A combined digital barometer and altimeter (instrument for measuring height above sea level) used for weather forecasting. Because air pressure varies in a very predictable way with height, some altimeters measure height above sea level simply by measuring air pressure. Photo by Andy Dunaway courtesy of Defense Imagery. Imagine you're an inventor and your job is to create a machine that can measure air pressure. How are you going to do it? Think about air pressing down on you and see if you can imagine building something that will measure its pressure. See if you can sketch something now on a piece of paper. Here's a clue. Imagine the air pressing down is contained inside a giant, invisible tube pressing down on Earth's surface next to your feet. If you imagined something a bit like a pair of scales that can measure the weight of the air in the tube, congratulations! That's pretty much the solution. A device that can measure air pressure (which we call a barometer) works by measuring how much the air is pressing down on it. Modern barometers are completely electronic and show the pressure reading on an LCD display. The two traditional kinds of barometer are called Torricellian and aneroid (dial) barometers—and here's how they work. Photo: A Torricellian barometer (sometimes called a mercury barometer) is an inverted (upside-down) glass tube standing in a bath of mercury. 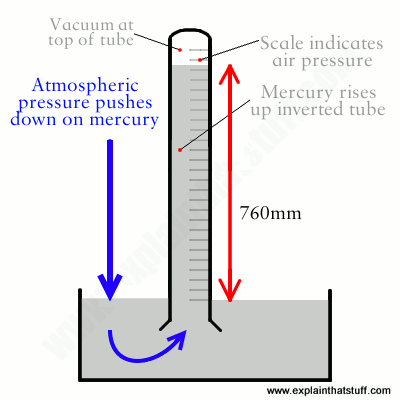 Air pressure pushes down on the surface of the mercury, making some rise up the tube. The greater the air pressure, the higher the mercury rises. You can read the pressure off a scale marked onto the glass. The simplest kind of barometer is a tall closed tube standing upside down in a bath of mercury (a dense liquid metal at room temperature) so the liquid rises partly up the tube a bit like it does in a thermometer. We use mercury in barometers because it's more convenient than using water. Water is less dense (less heavy, in effect) than mercury so air pressure will lift a certain volume of water much higher up a tube than the same volume of mercury. In other words, if you use water, you need a really tall tube and your barometer will be so enormous as to be impractical. But if you use mercury, you can get by with a much smaller piece of equipment. Evangelista Torricelli, Letter to Michelangelo Ricci, 1644. A piece of apparatus like this is called a Torricellian barometer for Italian mathematician Evangelista Torricelli (1608–1647), a pupil of Galileo's, who invented the first instrument of this kind in 1643. He took a long glass tube, sealed at one end, filled it with mercury from a bowl, put his finger over the open end, tipped it upside down, and stood it upright in the mercury bowl. Since he was careful not to let any air into the tube, the space that formed above the mercury column was a vacuum. Indeed, this was the first time anyone had ever produced a vacuum in a laboratory (and a vacuum made this way is called a Torricellian vacuum in honor of its inventor). At sea level, the atmosphere will push down on a pool of mercury and make it rise up in a tube to a height of approximately 760mm (roughly 30in). We call this air pressure one atmosphere (1 atm). Go up a mountain, and take your Torricellian barometer with you, and you'll find the pressure falls the higher you up go. The atmosphere no longer pushes down on the mercury quite so much so it doesn't rise so far in the tube. Maybe it'll rise to more like 65cm (25 in). The pressure on top of Mount Everest is slightly less than a third of normal atmospheric pressure at sea level (roughly 0.3 atm). 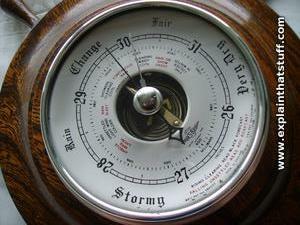 Photo: An aneroid barometer in close-up. You can clearly see the spring that makes the pointer rise or fall as the pressure changes. The sealed metal box is immediately behind the spring. Torricellian barometers are useful and accurate, but mercury is poisonous—and no-one really wants a great lake of mercury slopping around in their home. 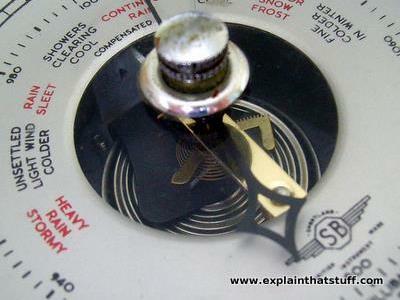 That's why most people who own barometers have ones with easy-to-read dials, which are called aneroid barometers. Instead of having a pool of mercury that the atmosphere pushes down on, they have a sealed, air-tight metal box inside. As the air pressure rises or falls, the box either squashes inward a tiny bit or flexes outward. A spring is cunningly attached to the box and, as the box moves in and out in response to the changes in air pressure, the spring expands or contracts and moves the pointer on the dial. The dial is calibrated (marked with numbers) so you can read the air pressure instantly. Artwork: An aneroid barometer is built around a sealed box (blue, sometimes called an aneroid cell) that expands or contracts with increasing pressure. As it moves, it pulls or pushes a spring (red) and a system of levers (orange), moving a pointer (black) up or down the dial (yellow). Aneroid barometers measure the air pressure when you knock their glass faces. When you first inspect them, the needle shows the pressure as it was when you last looked at them—however long ago that might have been. Give the glass a sharp tap and the needle will jump to a new position showing the pressure as it is now. The way the needle moves is important. If it moves clockwise, up the dial, the pressure is increasing so the weather is likely to be getting hotter, drier, and finer; if the needle turns counterclockwise, the pressure is decreasing and the weather is likely to get cooler, wetter, and poorer. There are lots of different units you can use for measuring pressure. Historically, scientists described ordinary atmospheric pressure as "one atmosphere" and said it was equivalent to "76cm (760mm) of mercury," sometimes written 76cmHg or 760mmHg (because Hg is the chemical symbol for mercury). You might also come across an old unit called the Torr: 1 Torr (named for Torricelli) is very roughly equal to 1mmHg (a mercury height of 1mm) or 1.33 millibars (another increasingly archaic unit)—roughly one thousandth (actually 1/760) of atmospheric pressure (0.0013 atmospheres). In modern SI units, one atmosphere is equal to 101,325 Pa (pascals) or 101.325 kilopascals (thousands of pascals or kPa). Pascals and kilopascals are the preferred scientific units for measuring pressure now. Air Pressure: A simple introduction from the National Weather Service. Includes an activity showing how to make your own aneroid barometer. How to Measure the Height of a Building With a ... Barometer? by Rhett Allain. Wired, June 21, 2017. An imaginative activity that teaches students the connection between pressure and altitude, and encourages a creative approach to solving scientific problems. Weatherwatch: Under pressure by David Hambling, The Guardian, 21 September 2014. How barometer technology has entered the 21st century with the development of piezoelectric barometers for smartphones. The Role of Air Pressure in Starting a Landslide by Henry Fountain. The New York Times, November 2, 2009. Slight changes in air pressure are enough to trigger land movements. EU to ban traditional barometers: BBC News, 6 June 2007. Mercury is highly toxic, but moves to ban its use in barometers have proved highly controversial. Physical Geography by James F. Petersen, Dorothy Sack, and Robert E. Gabler. Cengage Learning, 2016. An introductory textbook with a chapter on atmospheric pressure, winds, and circulation that explains what causes air pressure and how it relates to the weather we experience. A Manual of the Barometer by John Henry Belville. Taylor and Francis, 1858. An interesting introduction to barometers, written in the mid-19th century by a meteorologist from the Royal Observatory, Greenwich. Includes the early history of barometers, an explanation of how they're made, and a guide to making measurements. Largely for historical interest, though. Everything Weather by Kathy Furgang. National Geographic, 2012. A vibrant, colorful, 64-page guide in the Nat Geo Kids series. Good for children in the 7–10 range (large photos will interest the younger readers, while the text will engage older ones). How the Weather Works by Michael Allaby. Dorling Kindersley, 2006. A more serious, 200-page introduction for children aged 9–12. DK Guide to Weather by Michael Allaby. Dorling Kindersley, 2004. A basic, 64-page introduction for ages 8–10.